8-Track equipment from the not too distant future. Were on the eve of a new millennium and frankly Im disappointed. I came of age at a time when the future was seen as a magical place of hope, convenience and gracious living. In 1999 we were suppose to be able to take day trips to the moon and visit resorts on Mars. By now I should be living in a giant plastic geodesic dome where everything is self-sufficient and I could control the outside weather. Then Id be whisked away to anywhere in the world in the transporter pod from my silver lookout deck. 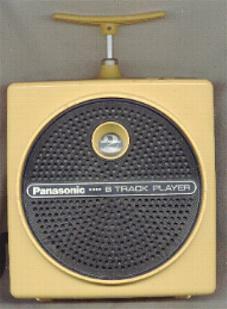 This section focuses on 8-track players made by designers who also shared this vision. 8-track tape production may have sadly ended but these evocative pieces still pay homage to a dream that may never be realized. 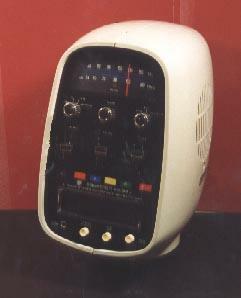 This AM/FM 8-track Sci-Fi Hifi is shaped like a volleyball and has several great features like a fixed base that allows it to rotate and for those who really want that moon effect. The top of the player has a chrome eyelet that with some strong fishing line can be mounted on the ceiling. Put on the soundtrack of 2001 to make the effect complete. It also comes in a Sun Yellow and a Mars Orange. Dont be fooled by the name this player has nothing to do with water. Its cream colored and in the shape of one of those head mannequins that wigs come with. The control panel looks like a spaceships instrument gauge. Each of the program selections has a different color orange, yellow, blue and green. 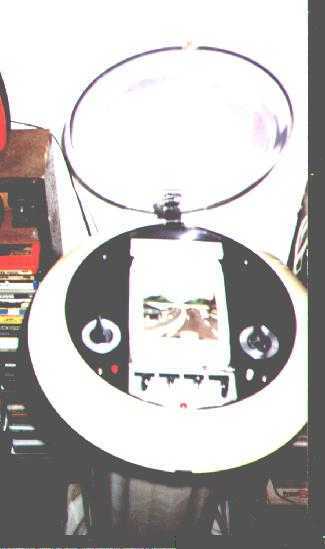 A clone of this was made in Canada called the Planetron. Dont know much about this machine. 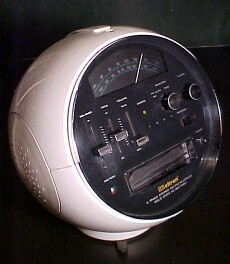 Its an AM/FM 8-track and is designed like one of those revolving restaurants that most large cities have. The black Plexiglas shield opens up for tape access. I bet George Jetson wooed Jane with one of these. 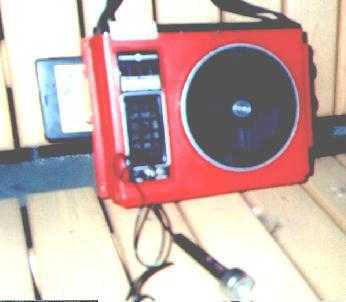 This little portable came in red, yellow, blue, and a rare smoked plexiglas variations decades before the IMAC. Its beauty is in its design: a single volume control, a faux large speaker grill that hides a 2 inch diameter one and a detonator handle that changes tracks. Great for the on the go jet setter and it even sports a port for a carjack attachment that plugs into the cigarette lighter. This Karaoke prototype has an attachment for a microphone in the front and a mic volume control on the side. Looking at it with the shoulder strap I can vision some drunk guy at a party wearing it with a lampshade on his head that everyone else is trying to avoid. This one can do everything but make coffee it comes in 3 pieces with a digital clock radio on the front that allows you to plug in a phonograph for the audiophile. I got it for $25 at a pawn shop and the guy could have been a used car salesman but with a few well placed lies and terms dropped like worn "capstan" and burned out "program lights" (they're temperamental) he changed his tune. It will probably end up in the "egg room".